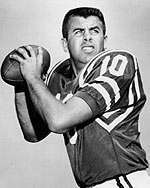 Stuart King Hill (November 8, 1936 – July 14, 2012) was an American football quarterback in the National Football League who played for the Chicago / St. Louis Cardinals, Philadelphia Eagles, and Minnesota Vikings. After attending Brazosport High School in Freeport, Texas, Hill went to Rice Institute in Houston, splitting time as quarterback of the Owls with Frank Ryan, who also later played in the NFL. Hill was an AP All-American in 1957, led the Owls to the Southwest Conference title, and played in the Cotton Bowl on New Year's Day. Hill was the first player selected in the 1958 NFL draft and spent over thirty-five years in professional football as a player, coach, and scout, and also as a key figure in the NFL Players Association. Hill served nine years as the players representative and Vice President of the Players Association in 1968 going through the strike and signing the first collective bargaining contract in pro football. One of the last three sports letterman in major college athletics (football, basketball, and golf). Played in the Cotton and Hula Bowls in 1958. Captain of the college all-stars beating the world champion Detroit Lions. First player selected (bonus) NFL draft 1958 by the Cardinals. Played professional ball for Chicago Cardinals, St. Louis Cardinals, Philadelphia Eagles, and the Minnesota Vikings. Offensive Coordinator for the Houston Oilers (1970–1980) and the New Orleans Saints (1981–1986). Assisted with the drafting and development of Earl Campbell. Established rookie NFL rushing record with George Rogers. Won more games than any team in the NFL during 1978–1980. Ranked second in total offense AFC in 1980, winning four of seven play-off games. Director of Scouting Western United States and Canada for the Philadelphia Eagles 1986–1992. Drafted and Developed play-off teams 1988–1990. Former member of the NFL Alumni Association. Always a skilled golfer, Hill never gave up his amateur status and through the years has participated in hundreds of tournaments, as well as being an active participant in the promotion of charitable golf tournaments in Texas and Louisiana. He also assisted in the founding and working of the Ronald McDonald Houses in Texas and Louisiana. Hill also helped with Big Brothers and other children causes in Texas, including the Special Olympics. His golf team won first place in the NFL Alumni Tournament in 1995 and 2001. He placed second in the tournament in 1996. Hill died at age 75 in 2012 after a long illness. He is buried at Forest Park Cemetery at The Woodlands. ↑ Smith, Ted (December 5, 1957). "King Hill, John Crow on All-America". Victoria Advocate. Texas. Associated Press. p. 12. ↑ "Forrestal pilots Middies over Owls, 20 to 7". Victoria Advocate. Texas. Associated Press. January 2, 1958. p. 10.